Despite some messages to the contrary, AVG 7.5 End of Support date is 31 Dec 2008. Changes to this policy are not anticipated but this is the link to watch. Even some notices out of the product itself say other dates. This entry was posted on 13 May 2008 at 10:51	by Rick	and is filed under Security, Technical, Windows. You can follow any responses to this entry through the RSS 2.0 feed. Both comments and pings are currently closed. I hate the new AVG. I hate it when these companies try to make an ‘all-in-one’ solution that doubles the size of the program, increase resource requirement etc, at very little gain. Currently I run Windows Firewall (No joke), AVG 7.5 (Anti-Virus), Spybot S&D (Anti-Spy/Adware, System settings protection, IE protection), Lavasoft AdAware (Anti-Spy/Adware, very rarely picks anything up), CCleaner (Registry/Temp-File/Startup cleaner and program uninstaller), HiJackThis! (System settings/registry) and McAfee Stinger (Gets rid of the real bad nasties). It’s all free, I don’t even update regularly or scan regularly, I haven’t had a threat in months, anything that’s gone wrong has been my own fault and to do with setting stuff up badly. So that’s all I need, I don’t need extra spyware protection from my anti-virus. I wish companies would concentrate on one field, anti-virus, anti-spyware, protection, whatever it may be. 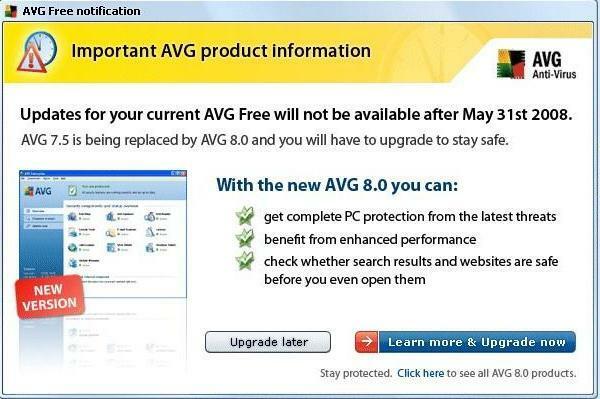 I’m not updating to AVG 8 until January 1st 2009. In many respects I agree with you and used to run a very similar suite of programs (except I added ZoneAlarm Free to protect the outward bound side of the firewall). However, it was a chore to remember to fire up the spyware stuff regularly and it often got forgotten. Probably like you, I operate in such a way that doesn’t attract nasties e.g. don’t go to places that are dubious and I think twice before opening anything for execution, I also always work in Limited User Mode so any potential damage is limited. For the many systems that I have installed for other people I omit the anti-spy/adware completely unless it becomes apparent that their usage styles require it. It was just one more thing for novices to remember. Now, with AVG 8, this is included by default. The functionality of anti-spy/adware is very similar to anti/virus. Both are looking for signatures, system behaviour and modifications and it kind of makes sense to combine them. I haven’t seen any evidence that 8 is any heavier on resources than 7.5 and it certainly is a lot quieter about its business. So on balance, I think AVG 8 is an exception to the one program – one task rule and the consolidation makes sense; but not some of the other stuff that they try to palm off on you, hence the other posting about how to install it.